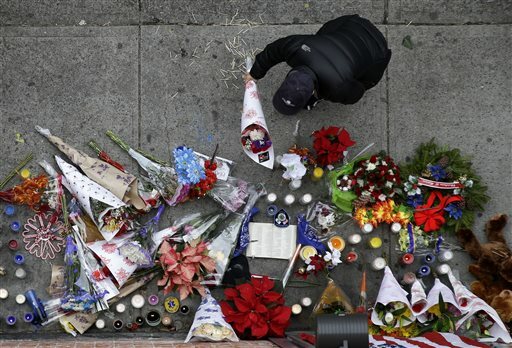 Civil rights leaders Sunday condemned the ambush killings of two New York police officers and expressed fear that the backlash over the bloodshed could derail the protest movement that has grown out of the deaths of Michael Brown and Eric Garner. “We are now under intense threat from those who are misguided — from those who are trying to blame everyone from civil rights leaders to the mayor rather than deal with an ugly spirit that all of us need to fight,” he said. Irene Sundiata Myers, a black woman who was selling roses and inspirational words Sunday on Harlem’s Malcolm X Boulevard, said that because of Saturday’s ambush, some officers might think twice about pulling the trigger on black men. “It will change the attitude of police across the country in terms of how they go about killing black men, if they begin to think that there’s a possibility that there will be a retribution,” she said. Jennifer Peltz and Mike Balsamo in New York City contributed to this report. Stevens reported from Concord, N.H.